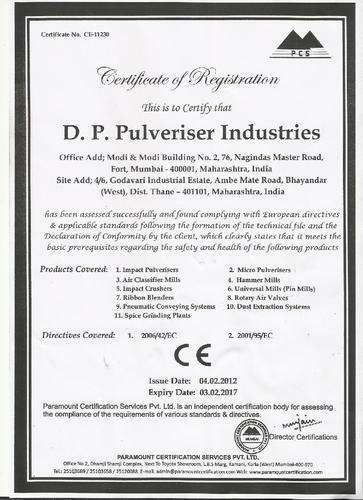 D. P Pulveriser Industries is originated at Mumbai in the year 1962. From over 52 years of experience in manufacturing Pulverising Machinery, Pneumatic Conveying Systems & Dust Extraction Systems, we achieved strong foothold in the market. We also export these products to various areas like Nepal, Bangladesh, Bhutan, UAE, Bahrain, Kuwait, Saudi Arabia, Mauritius, Philippines, Malaysia, Hong Kong, Singapore, Kenya, Tanzania, Nigeria, Ghana, Zambia, and South Africa and also to technically advanced countries like Australia, Germany, Switzerland & Canada. We offer various kinds of size reduction equipments that are used in various sectors like Agricultural Chemicals, Animal Feeds, Carbon & Graphite, Coal, Detergents, Fertilizers, Fillers, Food Products, Herbs & Spices, Industrial & Specialty Chemicals, Insecticides & Pesticides, Katha, Marine Feeds, Minerals, Plastics, Pharmaceuticals, Resins and Pigments. With the support of our team we are able to offer an unmatched range of products to our clients. These are manufactured in our advanced manufacturing unit under the guidance of our team. Our range is also tested on various parameters to offer high quality products to our clients. Furthermore, with the help of all these facilities we captured market for ourselves in the industry. Our organization is supported with a spacious manufacturing unit that is spread across a wide area and located at Mumbai. 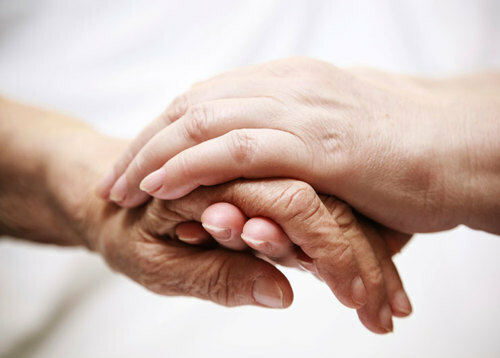 This unit is managed by a team of experts who are highly qualified and experienced. Our personnel are the main reason behind the sustained success we enjoy. They use premium quality materials that are sourced from the trusted and certified vendors in the industry. We also upgrade this unit at regular intervals of time to offer products based on the specifications of the customers. D.P. 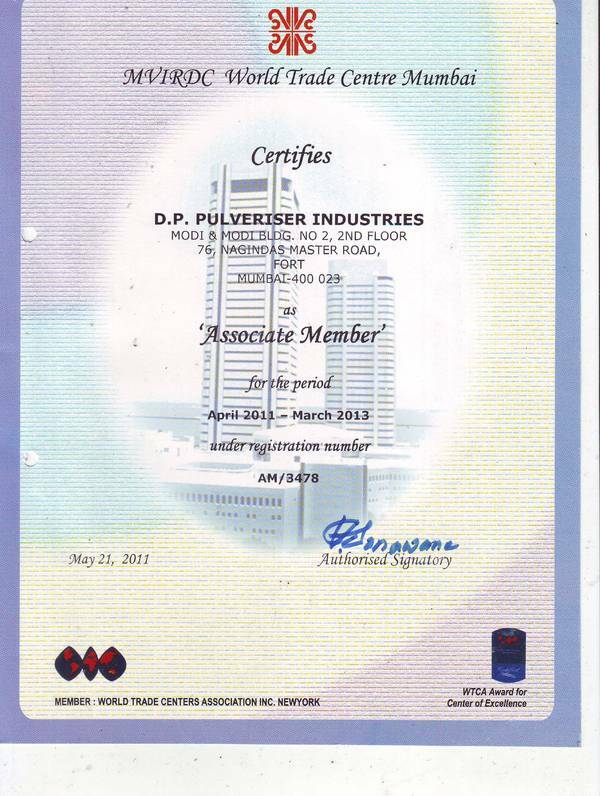 Pulveriser Industries has been supplying its products to almost all continents, including countries like Australia & Canada. Till date, D.P. Pulveriser Industries has been supplied/installed its products in the following countries. D.P. 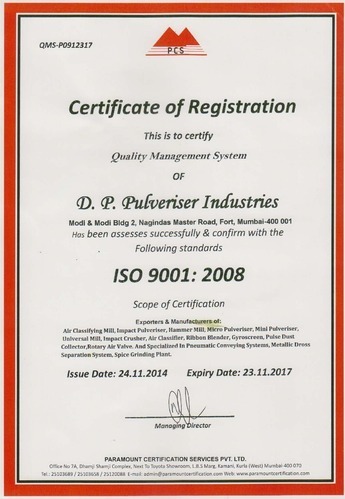 Pulveriser Industries has established more than 5000 units of pulverising machinery, pneumatic conveying system and dust extraction system in India and abroad to the complete satisfaction of the clients. Though all products (Air Classifying Mill, Impact Pulveriser or Impact Pulverizers, Micro Pulverizers or Micro Pulverizers, Universal Mills (Pin Mill), Hammer Mills, Impact Crushers, Rotary Air Valves, Vibro Sifter, Air Classifier Mills, Pneumatic Conveying Systems, Dust Extraction Systems, Spice Grinding Plants, Metallic Dross Separating System for Copper, Brass, Aluminium & Zinc Dross & Spice Grinding Plan) are designed for minimum maintenance, yet D.P. Pulveriser Industries offers a regular after sales support services to ensure the optimum performance of its systems. For this purpose, the company has a wide network of our after-sale-service teams all over the country. D.P. Pulveriser Industries is a leading manufacturers ,supplier and exporters of pulveriser plants and machines like Air Classifying Mill, Impact Pulveriser or Impact Pulverizers, Micro Pulverisers or Micro pulverizers, Universal Mills (Pin Mill), Hammer Mills, Impact Crushers, Rotary Air Valves, Vibro Sifter, Air Classifier Mills, Pneumatic Conveying Systems, Dust Extraction Systems, Spice Grinding Plants, Metallic Dross Separating System for Copper, Brass, Aluminium & Zinc Dross & Spice Grinding Plan.